BOISE, Idaho — Steve Exceen and his daughter Sarai have a special bond with Mary Braunstein and her daughter Khloe--so much so they say the four Idahoans are a package deal. "It was basically like...(pause)...friendship at the first moment," Sarai said. You might remember the special moment, caught on camera, we brought to you back in February. 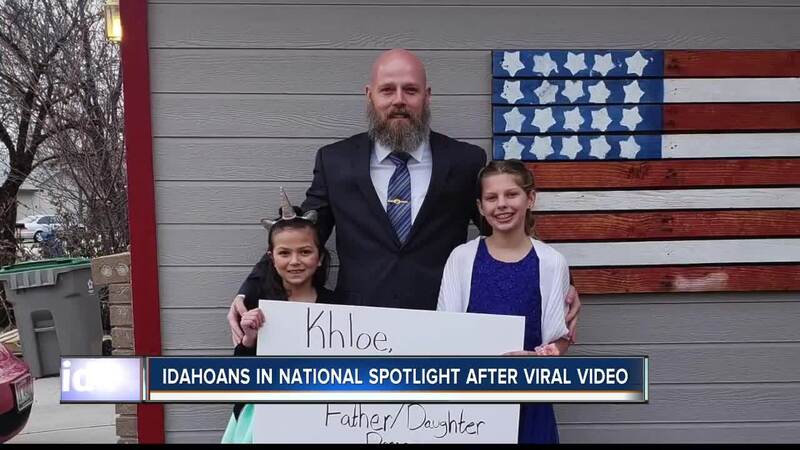 A local veteran and his daughter stepped in to take a fifth-grade girl to a daddy-daughter dance after she lost her own father to suicide due to his battle with PTSD. The sweet video went viral and now has more than four million views. When the four Idahoans got a call asking them to appear on the nationally broadcasted Pickler and Ben show, it was a no-brainer that they'd all go together. Of course, they got the star treatment backstage. "When we were first walking back there I was thinking, 'Is this really going to happen? Is this real?'" Exceen said. "We walked back there and each of us had basically our own dressing room." It was an experience Braunstein couldn't have imagined in her wildest dreams. "Meeting Kelly Pickler in person was really awesome," Braunstein said. "I know every single person that was on the set of Pickler and Ben was absolutely outstanding, some of the nicest people we have met." Before the heartwarming video went viral, Khloe had been dealing with some bullying at school for not having a dad. She says the video changed everything. "Not anymore because of this, and I explained to everyone what happened," Khloe said. When Exceen offered to take Khloe to the dance, he wasn't expecting the impact the video would have--including bringing awareness to important issues. "I've received numerous messages from other individuals that are going through the same thing," Exceen said. "It opened doors for other things... anti-bullying, raise more awareness not just for veteran suicide, but suicide in general in our own backyard. I think it opened a lot of doors in that aspect." Exceen says while the experience was amazing, it wasn't about him. "This experience wasn't about myself. I believe it wasn't for Mary either. It was about these two (Khloe and Sarai)," Exceen said. "It was having the experience--something they can look up to and use that to potentially fight the war we have at home--bullying and suicide." If anyone learns anything from the video, Exceen hopes people take away the idea that we should not be afraid to be kind to one another. "If you can understand that with [Khloe's] story, sometimes don't push back from the kid that was bullying--embrace them," Exceen said. "A lot of times it's because how they're raised and they don't know a difference. Don't push a bad kid away. Maybe embrace them. Tell them your story--don't be afraid to tell your story." The episode of Pickler and Ben will air Monday morning at 9:00 a.m. on 6 On Your Side.